I'm really excited to be teaching a group of S1 pupils at Kinross High how to make detailed models and do a short dramatic animation. We only have 6 one hour sessions but hopes are high. Here are their initial plans, come back to the blog to see their progress. Amazing and detailed 2D characters made by 3XL at Braidhurst. Front and back views of the puppets are spot on! Cant wait to see them animating. Olaf will be proud! Squished up a few of the ideas from the class into one film. OK, so its basically a cook off programme hosted by Ainsley Harriot (famous celebrity chef) but the contenders are fantasy characters and action heroes! So far we have Shrek, a ninja, a knight and a dragon. Other possibles include Peter Pan, Rapunzel and a dog! Ainsley will introduce the new cooks who will each try to cook a special dish. Keep each character's little bit of animation simple. Keep the special way they cook also related to themselves. You mentioned that the dragon would cook food with fire. Sounds great. Characters could travel out of the kitchen (to get an ingredient) This must be brief and not be a massive story itself! Remember 3XL, come up with a good ending for the film. Was he/she going to come back to the football pitch and finish the game? Was there a half time? Were oranges involved and how annoyed are all the other players cos of their long wait? Keep us informed....send pictures, cant wait! XL Teachers learning how to animate!! Yes....even teachers have to learn something sometimes. Jim's survived teaching 5 teachers (Art and Tech teachers too) at Cumbernauld Academy. Part of Princes Trust's brilliant 'Arts and Employability' program. The 3 film ideas from the class are coming along well. Here's the story development from the groups. The "catronaut" story is coming along with work developing on creating characters and props as you may have seen from the pictures. The "Mickey Mouse" story involves a wedding between Mickey and Minnie which is halted due to an objection from a Family Guy character (?!). The third story is the one where the boys have developed the person falling from the plane scenario and a "dead cat" bounce as the falling man squashes some unfortunate passer by. St Maurice's high school have started planning their films now so keep coming back to see how its developing. At the moment there are 3 short films in production and the groups are still developing their ideas. Bus some sketches of characters are coming along nicely. A planes engine blows out causing the plane to fall. The passengers start floating about and vomitting all over the place! The largest man on board gets sucked out of the door and falls to earth!! Not sure what happens next but it might involve bouncing! Space cats (catstronauts?) land their rocket on Mars. Theirs something there they want and they will take it at any cost! It might be milk or fishy related as it starts to rain milk at some point in the story (can't wait to see this) Only proble is the planet is not empty! Its inhabited by weird alien mice cratures who are pretty angry! Needless to say, there will be a battle! Not sure of the story yet, but a third film uses Micky and minnie Mouse in a brand new adventure. Keep expanding these stories groups....we need scenes and backgrounds and lots of clever ways to win any battles. think of what that kind of creature would want or like and make jokes out of it! have fun. We've had an update from the 3XL class at Braidhurst High. One pupil emailed Animation Jam with this. Braidhurst's pupils are already designing characters and started a few backgrounds. So far we have one view of the classroom and a bit of the magic cupboard. The story is developing nicely too, though it doesn't quite have an ending! See the older post for the storyboards. Here we go!! Definitely a smashing film coming along! The kids are working on an idea where the teacher of an unruly class turns into the Hulk causing the kids to run into a cupboard only to appear in Narnia where they are confronted by Olaf the snowman (from Frozen) whom they kill. The teacher then wakes up and realises it was all a dream. 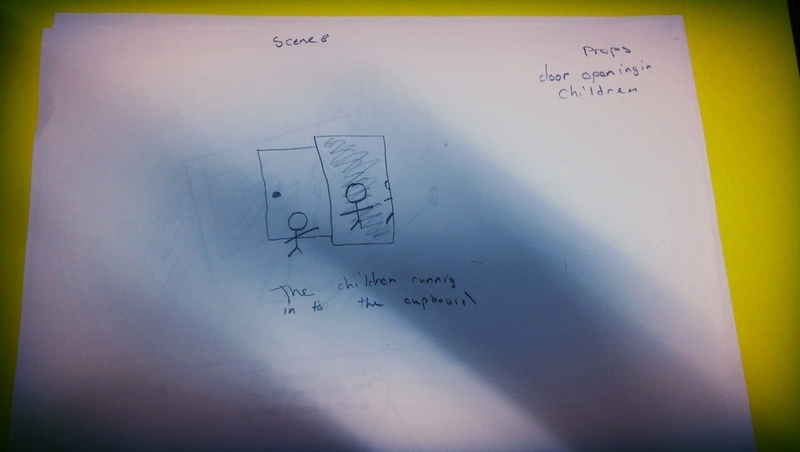 Can't wait to start seeing artwork......storyboards are already started. Well, its January again and the only thing that gets me through the winter days is seeing the school groups in North Lanarkshire developing funky ideas for cartoons. Animation Jam work with the XL Groups within the high schools each year as part of the Princes Trust's 'Arts and Employability' program. We teach them how to make their own animated film and, with the support of their teachers, they finish it for an early April deadline. I hope to post some of their ideas as they develop here.